Please do feel free to contact me at nick@flyaoamedia.com with any questions or comments. I am targeting a career in commercial aviation and would be grateful to hear from you. There is a core belief we have here at Angle of Attack: an external model is useless without the ‘real deal’ on the inside. Unfortunately, there is a lot of eye candy out there in the FS World, but not a lot of outstanding cockpits that are not only modeled to the gills, but almost 100% functional. Although Nick’s 737NGX Walk-Around shows the level of detail PMDG goes to with their external models, honestly, that’s not where their products TRULY shine. We know it’s awesome, but wait until you watch this video of the 737NGX Virtual Cockpit. The depth of systems detail PMDG puts into their aircraft is truly impressive as current PMDG owners know, but this is the latest and greatest from PMDG. It’s a whole new ballgame now. As you’ll see, the cockpit, controls, visuals, systems, and everything else to accompany it has set the bar very high for future virtual airliners. And we haven’t even got into the air yet! In this video Nick will take you through yet another casual look at what PMDG is offering. Nothing too complex here, no real formal training like what you’ll get with our 737 Training videos, but simply initial thoughts and reactions to how the real aircraft operates. All that said, this is a partner video to Nick’s 737NGX Walk-Around, and was specifically made at the same time to give a complete overlook of the aircraft. Consider this Angle of Attack’s delivery inspection. I made this video to show the aircraft to another member of the AOA team who is entitled to the wide beta but has had computer troubles and is not yet able to use it. It was intended to show him the aircraft so that he could get an idea of the equipment simulated. It was therefore entirely off the cuff, unscripted and not intended to be instructional in any way. This video therefore does not reflect the standard of our final training product. It is rough, and my informal, off the cuff explanations may at times be inaccurate. Our final product is meticulously scripted and structured so as to provide the best learning experience. This video was intended solely to put across my initial thoughts and a quick look at the incredible depth to which PMDG have simulated the 737NG. We hope you enjoyed this candid look at the beautiful rendition of the 737NG’s Cockpit. Checkout Nick’s 737NGX Walk-Around to see what’s on the outside. Don’t forget to sign-up for updates on our 737NG Training! What did you notice that really impressed you about the PMDG 737NGX’s virtual flight deck? It’s only been posted for 5 minutes and you’re already saying wow! Guess that’s a good sign. There’s a lot more video left, man. Keep watchin’! What camera software do you use? I also use this software, but didn’t manage it to pan around nicely like this. It seems to me that Nick used his keyboard to navigate around!? How long b4 the training vids are for sale?? Going to watch it for the second time now. I really liked Nick’s thorough description of the systems. He seems to have a very wide knowledge of the 737. In Nick’s exterior view thoughts video, he also showed to know every corner of the plane. You say that those wasn’t supposed to teach anyone about the aircraft, but I imagine how would it be if they were indeed intended to be educational. Can’t wait to have that plane on my PC and, of course, your training package for the NGX too, which I intend to get on day one. I bought the MD-11 package a few weeks ago and loved it. Honestly, I think Nick’s knowledge of the NG (and classic, for that matter) is almost as impressive as the NGX. Very cool stuff. Thanks guys, I can’t tell you how much those compliments mean. What system specs is Nick running? seems to be able to run FSX very well with minimal stutter. Nick actually doesn’t have a crazy system. His specs are listed as: i7 920 @ 4GHz, GTX 480, 6GB Corsair 7-7-7-20, 300GB WD Velociraptor, Corsair HX850W. From what I’ve noticed, the big kicker here is simply the care PMDG took with their program. This thing has an incredibly reasonable framerate for the detail. I want to really spotlight that too. That’ll come up here in a week or so. Hi Chris does Nick install FSX on the same HD as the OS? From what I understand it’s on a separate drive, which is against my recommendation. You’ll have to let him chime in though. Do you prefer both on the sane drive? I’m speechless…flabborgasted..dumbfounded..overcome and overwhelmed. What more can I say! This is a real multi-million dollar commercial aircraft, that we can own and fly anywhere in the world, right from our computer. It is unbelievable how far PMDG has taken this passion. Yeah, it really surprised us too. It’s something I guess you literally have to see to believe! WOWOWWOW! Awesome video guys and an awesome aircraft! I was wondering what Nicks specs were. At least I don’t have to worry. i7 920 @ 4GHz, GTX 480, 6GB Corsair 7-7-7-20, 300GB WD Velociraptor, Corsair HX850W. Mode 7 GPWS yes. Predictive Windshear no. A little detail to check with PMDG devs… Posteed on their forum also. It’s about the Fuel Crossfeed Selector. 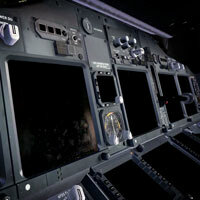 I really love the real world imperfections PMDG made in the cockpit, such as the fingerprints on the displays. I can’t wait for this one to come out! A lot of amazing little touches there! Very cool. Yeah, well, come on, its time publish this airtcraft, its ready enough! No it’s not. There is still some work to do. You’ll be happy when you get a complete, non-buggy aircraft. What joystick or flight controls does Nick use? Nick uses the CH Products Yoke and Pedals, with the Saitek Throttles. I use all Saitek, and don’t know why anyone else wouldn’t. To each his own, I suppose! Excellent video of the virtual cockpit, ive purchased a number of 737 products from various companies and there are none that come anywhere near the quality and realism of this one, this plane will definately be the closest thing to actually flying the real plane and I look forward even more to purchasing it upon release! It’s quite incredible, right? I felt like a broken record when I kept telling people this. It’s nice that everyone is starting to see that. I guess all it really took is showing the product intimately that did it. Oh man, that’s freaking unbelievable! Thanks for the upload Nick, Chris and AOA! You’re very much welcome, sir! Wow!! Amazing! I noticed the option “Cabin Layout” in the CDU, is there a Virtual Cabin in it? Or is it just changing the weight/payload stuff? The virtual cabin is shown in the walk around. I’m sure this selection also has to do with weights as well, among other factors. aboslutly fantastic! My jaw was on my keyboard the whole video. PMDG have created something thats just pure art. That was awesome you guys.. Nick, nice work.. Looking forward to this one.. Sorry, no Youtube. They only allow 15 minute videos. If you select off the HD, you can get back to your spot much quicker. I also want to give mention here to Nick. What a great person to have on the AoA team! The knowledge of the 737NG that he displays here on this video, really gets me excited about what is coming up for the AoA 737NGX program. All of the AoA programs have been excellent in all aspects, but I recognize that Chris Palmer has always been obsessed with finding ways to make them even better. It is obvious that finding Nick, and recognizing his talent, was a result of that ever present obsession. I have to say that as amazing as this PMDG 737NGX is, and as much as I’m looking forward to owning it, I am looking forward equally as much to the new AoA 737NGX production that will accompany it. Never before, has a simulation for home PC reflected this kind of reality. Never before has such a complete instructional program been offered for a home PC simulation. It will certainly be the sweet icing on the cake, and a real foundation to the extreme PMDG 737NGX experience, to be able to know the systems, routines and proceedures, to flying this bird in a similar manner as the professionals. The only limitation will be my humble and limited ability to absorb it all. Very kind words indeed, and very much appreciate by our whole team. Nick is a true asset. He shows his true colors time and time again, and we recognize his talent. We’re very excited about our products to come for this aircraft. We think we’re doing something quite special in not only teaching the aircraft in the way we’ve become known for, but also reacting to community feedback and giving you guys the level of detail you desire. That means quite an extensive list of things to do, but it also means the best training we’ll produce to date. We’re excited as well! Thanks, that really means a lot! I see real potential for career progression here, so rest assured that I’m putting my all into it and won’t accept anything less. Nick doesn’t have to make any apologies for the video(s): they are fantastic and clearly show the amazing standard and overall quality of this PMDG plane. Amen to that. It’s not such an apology as it is a disclaimer that our actual products are produced to a much higher level. That’s all he was getting at. Hi, can you make or show a little tutorial of how you use the Ezdok camera?? We’ll get around to this some day when we aren’t so busy trying to simply produce our product. We’ve had a lot of requests for it. but do you use a joystick to move the point of view of the camera? No. I believe it’s being done with the mouse and keyboard only. This is the easiest way to do it, at least for me. Nick may have a different method. Totally agreed. Couldn’t say it any better. Too late, I have one already which is very similar and I’m happy with that I have got. I think the price going to be more impressive than this cockpit. Have Fun PMDG. Mind-numbingly amazing video. It’s like its own simulator, and your commentary makes it that much better. Out of curiosity, do you guys have a 737-700 version as well as the -800? Just awesome – Wonder if Boeing will use it as a selling aid to customers, I’m sold already lol. Truly awsome. realley it’s amazing video, I’ve never seen such this. thank you very much, keep going. God bless you. Amazing, watched the full length of it, pure epicness! I had a good giggle at that too. Yup, the clickspot overlapped a bit! It looked like you were in a real 737 the cockpit textures are remarkable. Great stuff. It’s very refreshing to hear someone talking about this stuff who obviously has a great knowledge of the aircraft and talking about it without sounding boastful. I will be buying the training and looking forward to it. I wasn’t implying that anyone from Angle Of Attack was boastful before in any way. Hello Sir : What is the walk software that you using ? you walk very smoothly and beautiful ! seeing as how PMDG are doing a darn good job with ANP and RNP navigation, can you do a tutorial that deals with this subject? I know theres alot of people out there including me who have only a basic grasp on the idea. It will for sure be in our product, and often. Not sure how in depth we’ll go publicly that way, but we may show a few things. Expect a clear explanation of ANP/RNP, yes. We will be shooting at least one RNAV approach. Great video! Looking for more updates. Thanks to all you who made the video, plus PMDG for a great product. Does PMDG give with the 737NGX, in connection with the Angle of Attack training, a job guarantee? Another very interesting video many thanks for taking the time to do it and sharing with us. It is much appreciated. Will the training for this be on just one DVD? Amazing video. Looking forward to your first lessons. Hi all been siming since 1998 and i must say this is as Real As IT Gets, speechless! It’s for this reason I founded AOA over 5 years ago! I was fed up with all the manuals that told you nothing, and the non-experienced flight simmers that didn’t know what they were talking about. I wanted answers, and I wanted those answers to be visual. So yes, it absolutely speeds up the process but it also makes the process entertaining, complete, and fulfilling. A way to ‘follow along’ is to play the video say on an iPad or another device along side the sim. Technically you could have the sim and a video in windowed mode, but it’s best to get the sim full screen and have our videos on another device or TV. Hope that answers some questions! Sounds like you came to the right place 😉 Sign up for Aviator90 (it’s free) and see what it’s all about. Does the 737NGX simulate RNP approaches? From what I understand they are simulated to a certain extent, but the issues is that generally it’s individual airlines that control their approach data. Not sure what PMDG can/will/is doing about that. Congratulations about your videos and training stuff avaliable clear and precise. Concerning the PMDG 737NGX cockpit that’s the first time I see a running 100 percent one. The FMC seems to use Navigraph last AIRAC data. Does the PMDG have a weather radar display ? I am waiting for your 737NGX videos and the plane from PMDG. I think my favourite plane iFLY 737NG completly out of order in front of such a plane. What are the PC requirements in front of such a plane !!! Excellent ‘walk through’ as Nick calls it but in some ways it is very instructional as I have flown the original 737NG in FS2004 and I can see it is going to be a whole new learning experience for me. Hope I can cope!! Push the “‘TERR” button on the EFIS panel to view the Terrain Radar. just wanted to say well done on the NGX vids! The vids sold me on the product. Just wanted to aks Nick what his EZCA settings were for the NGX? I have finally managed to see the video after previous attempts ended in stuttering and stopping. Now that I have seen it I can only say, “breath-taking”, and even this is an understatement. This video has to be seen to be believed! Everything about it is so impressive that I feel I must buy the training video, even though I am virtually deaf and have tremendous trouble trying to understand the narration. It is so good that I will enrol for the training and try and sort out my problem after enrolling. I will even try and subtitle the video by begging a relative to aid me. This training is a must! The cockpit, etc., is so realistic that, together with Nick’s thoughts and narration, it feels as if one is on the flight deck in reality. Congratulations to both of you, Chris and Nick, for bringing this video to us. I, for one, am looking forward to seeing and learning more. This is going to be provided to our 737 Members as a bonus. There are other round about ways of getting it done, none of which I know of. I hate to say it, but this aircraft is one of the worst fps hogs I’ve ever owned. If they had the guts to have a policy like Flight1’s, I would be done with it. This is with a new sandy, set up only for FSX. If I only flew default scenery and litttle to no ai than it would not be the major issue it is. I’m not willing to overclock to that level to be happy with it. Well John, there is definitly something wrong with your setup. I have a sandy bridge, use REX, UT, nl2004, and I get (sliders all to the right) 25/35 fps on the ground in a heavy ad on environment (schiphol) and 40-50 in the air. May be you have a slow HD or old RAM? Hi Nick, great job on the video, my question to you is, how can I turn on the weather radar, I found the weather panel but the bottoms just dont seem to work? why is that? something wrong with my pmdg? I hear that with the new ActiveSky that is about to come out, that this could become a reality finally. As an aspiring airline pilot, realism is very important and only the best will do. But judging from Nicks video, I can certainly say there is no worries on compromises in realism. I don’t have the pmdg 737 yet, because, first I want to finish the aviator 90 and go through the aviator pro training. But I can’t wait. Many, many thanks for these videos Nick. They’ve helped me decide to purchase PMDG 737NGX and I will sign up for the 737 Training tomorrow. Hello I have NGX B 737 and it have the frame rates low like 4 to 13 frames a second. How do I make better ? ? How is the many lesson are there is the 737 Trains ? Fank you. Andrico from Madrid, Spain. P.s. Sorry for the bad Inglish. Go there for starters! Then, make sure you don’t have light bloom on, and your water is set to Low 2.X. That should help out a TON. Hello Sir : I do not like you anymore ! Hi, Ive just seen this amazing video. I of course also got the NGX for my FSX. One question, if you dont mind me asking, how do you get those stunning bloom/reflection effects on your gauges? Im talking about the moving reflections on the panels about 1 min into the video. Ive set up everything with max settings, use DX10 with the fixer (loaded steves standard HD profile), TML4096, everything on. Runs great and looks nice, yet by far not as realistic as in your video. Are there some nvidia inspector settings, or in game settings that I need to enable in order to get this dynamic reflections effect? Thanks for your help!! Has anyone else noticed the cockpit dimensions are not very realistic for the ngx? The windows seem rather large, don’t you think? The top of the forward cockpit windows could have been brought down a few inches to give it a more cramped feeling, like the real 737’s! That’s just my own opinion though.. I think it’s pretty dang real. Of course it’s hard to get it just perfect, but it’s believable. Well, I really hope they release the ngx sp2, to make the cockpit even more believable! I’m totally with you on that! that was my biggest annoyance when they released the NGX, and it took me a long time to get use to it. I’ve been in real 737 cockpit’s more than a few times, and the NGX just doesn’t do it justice.